I used to work in an office building in downtown Indianapolis, nestled among restaurants and coffee shops. Nordstrom Café was on one side of me and the Omni Severin coffee and sweets counter was on the other. I usually grabbed a coffee and a muffin from one of these places before getting settled in each morning. Or I’d grab a scone. Or a croissant. Maybe I’d grab an afternoon treat too. It got a little out of control. After I started working from home I managed to kick my muffin habit and replaced ridiculous quantities of caffeine and sugar with things my body actually needed. And I’d love to say that now all I eat are organic salads and raw broccoli, but that’s never going to happen. Sometimes a girl just needs a muffin. And so after much searching and experimenting I came up with a recipe that we find kind of awesome. If we aren’t grabbing a hard-boiled egg for breakfast, we’re grabbing one of these Spelt & Honey Banana muffins. This recipe is a result of trying to make banana bread healthier without tasting healthy. I think it’s a winner. 1. Preheat the oven to 325 degrees Fahrenheit. Grease a muffin tin and set aside. 2. Mix applesauce, honey, vanilla, eggs and bananas together thoroughly. Then mix in spelt flour, salt and baking soda until ingredients are well incorporated. 3. Fold in walnuts and chocolate chips. Then drop mixture into a heavily greased muffin tin. 4. Bake 28 – 30 minutes until golden brown. Cool on rack. Is this what you made for us last month? Those were GOOD! Do you think this would work in loaf form? Yep! You were the first to receive the experiment 🙂 I think it would totally work in loaf form, just a little bit longer bake time. Educate this country bumpkin…what is “spelt” flour? Hi Patsy, Spelt flour is an ancient grain that I only just discovered a year or so ago. It is very similar to whole wheat, but has a bit more protein and slightly fewer calories. 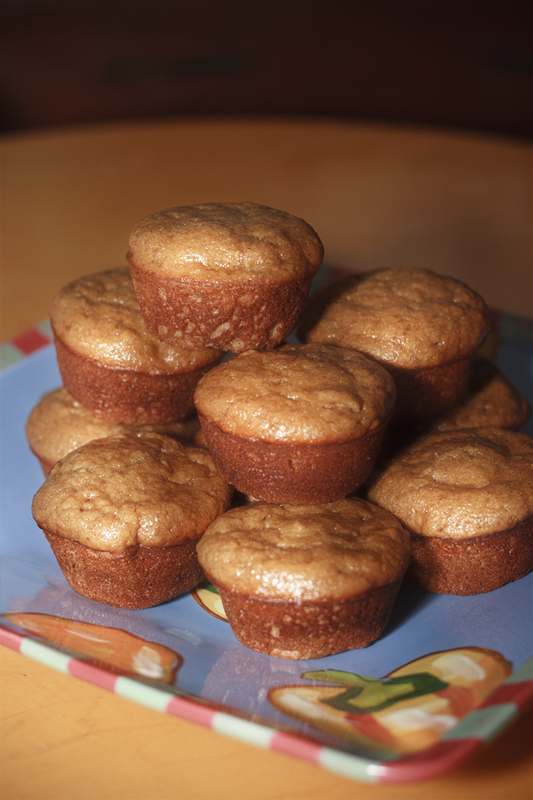 It’s also lighter than whole wheat as well, which is why I think it works so nicely in muffins. Here’s more on Spelt: http://bakingbites.com/2008/04/what-is-spelt-flour/. I am a friend of your sister Mary. We met over 40 years ago. We were roommates for a summer and friends since. She told me about your blog and I just realized I had to subscribe to stay in touch. Love what you are doing–so creative! Thanks so much for reading! So glad to have you following along.